30 Tippett Road is the building to the right of the Station Condos in this picture shaded in blue. 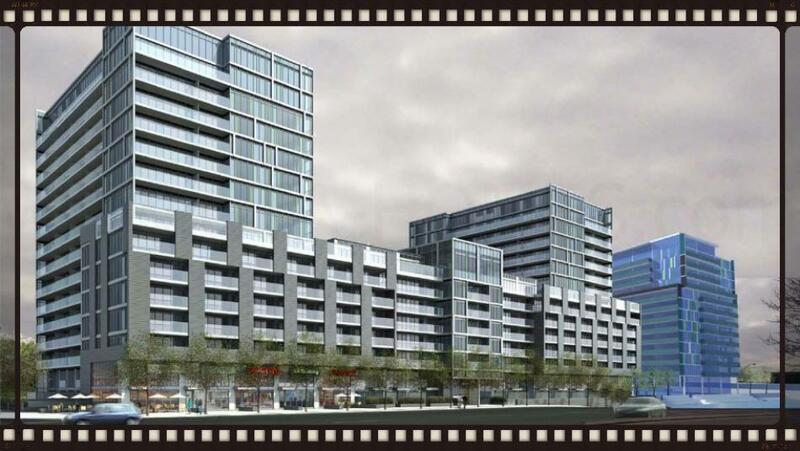 The Rocket At Subway is a new mixed-use condominium development by Metropia Urban Landscapes and is currently in pre-construction at 30 Tippett Road in Toronto, Ontario. 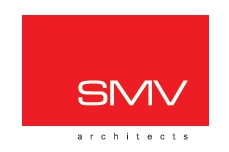 The proposed development is located near the Allen Road and Highway 401 and consists of two buildings that are 12 and 8 storeys in height designed by SMV Architects. 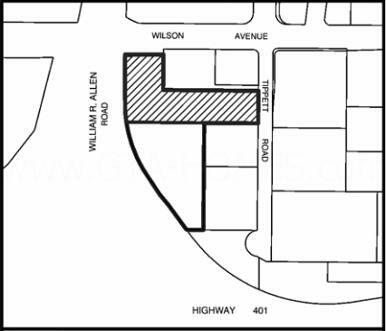 There will be a total of 396 residential units and 213 parking spaces. Metropia Urban Landscapes is the real estate developer that will be developing The Rocket at Subway Condos. Their vision is to be "the most community-minded creative developer in all of Canada" with communities around the Greater Toronto Area as well as in Calgary, Alberta. Below is a list of some of their residential developments thus far. The Yorkdale Condos - A new condominium development with Context currently under construction and is selling located at Ranee Avenue in Toronto, Ontario. This is the first phase of a master-planned redevelopment of the Lawrence Heights Community on 100 acres. This development is scheduled to be completed in 2017 with 622 units and pricing for available units starts from $499,900 to over $549,900. Exhibit Residences - A new condominium development with Bazis Inc. and Plaza currently under construction and is selling located at 200 Bloor Street West in Toronto, Ontario directly across from the Royal Ontario Museum. Designed by R. Varacalli Architect with 32 storeys and 204 units. 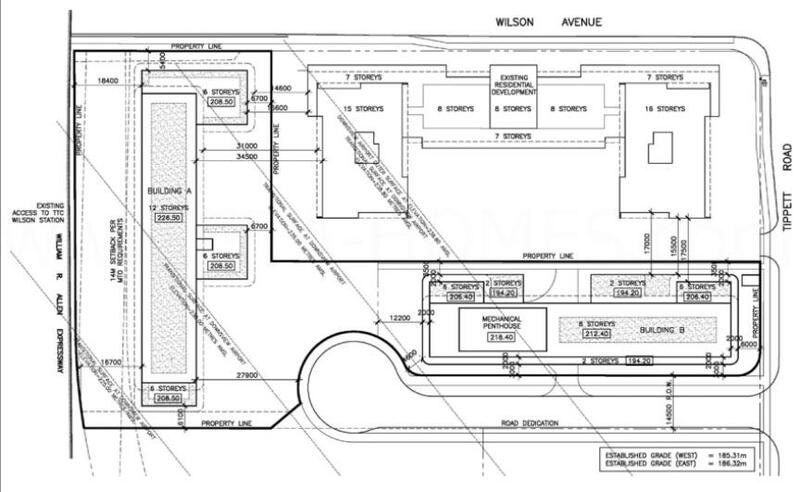 Available unit size range from 2,179 square feet to 2,333 square feet with prices starting $2,899,900 to $3,889,900. Estimated completion date is 2016. Amenities include concierge, exercise room, yoga and pilates studio, party room, lounge, dining area, caterer's kitchen, water feature, garden and guest suites. Emerald Park - A new condominium development with Bazis Inc. and Plaza that was completed in 2014 and is sold out located near Yonge Street and Sheppard Avenue in Toronto, Ontario with 42 storeys and 450 units. Amenities include concierge, exercise room, yoga and pilates studio, pool and rooftop terrace. Brentwood on the Park - A new townhouse development with Knightsbridge Homes currently under construction and is selling located at 3802 Brentwood Road Northwest in Calgary, Alberta with 20 units. Available units range in size from 554 square feet to 1,830 square feet. Prices for available units starts from 334,900 to over $689,900. Scheduled to be completed in April of 2016. Building Four at University City - A new condominium development with Knightsbridge Homes that is selling located at 2500 University Drive Northwest in Calgary, Alberta with 12 storeys and 143 units. Available unit size range from 468 square feet to 488 square feet with prices starting from $309,900 to $330,900. Amenities include a meeting room, fitness room and bicycle storage. 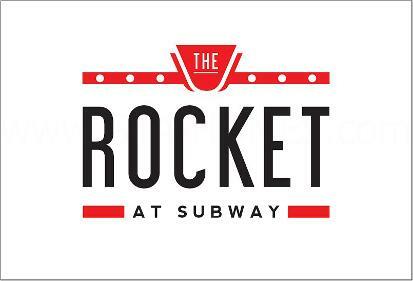 Register with us today for The Rocket at Subway Condos floor plans & price list by Metropia Urban Landscapes! Register today for floor plans & price list!